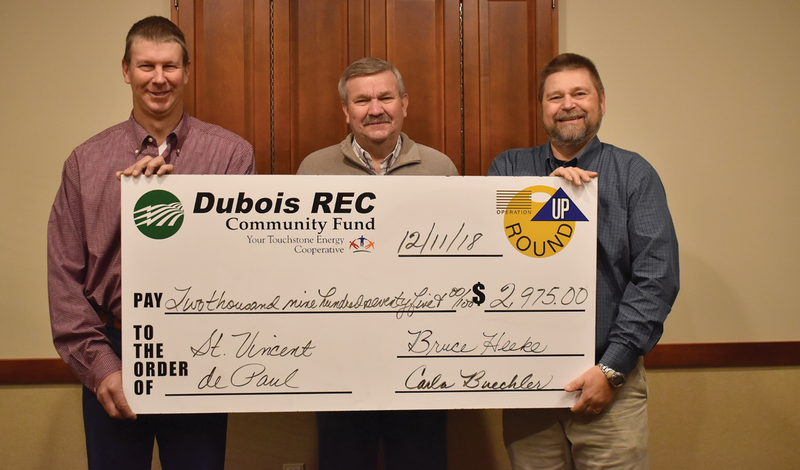 COUNTY WIDE -- Trustees for the Dubois REC Operation Round Up fund met in December to award grants to five local organizations and school groups. This brings the total amount of grants awarded in the community to $355.987.68 since 2011. Operation Round Up is just what the name implies. Dubois REC members simply allow the co-op to “round up” their electric bill to the next highest dollar. That spare change goes into a fund that is overseen by a board of trustees, who are also Dubois REC members. Local groups and organizations can then apply for grants from this fund. The Dubois County Museum received a $2,500 grant to expand their “Just For Kids” program. Young Life received a $2,000 grant to update office supplies and technology used in administration of the program. The District of Jasper of the Society of St. Vincent de Paul received a $2,975 grant to partially fund the replacement of the HVAC system in Ozanam Hall, where Dubois County Community Meals are served to people in need. The Patoka Lake Watershed Steering Committee received a $2,000 grant to fund public outreach, educational events and materials and community awareness campaigns. Dubois REC will accept applications for the next grant cycle of Operation Round Up® grants Feb. 1-28. Grants must be submitted before 4 p.m. on Feb. 28. Representatives from local civic groups, non-profits or community organizations who would like to apply for an Operation Round Up grant can download the application forms from www.duboisrec.com. Applications are also available at the Dubois REC office, by calling 812.482.5454 or sending an email to Kyla Jones at kylaj@duboisrec.com.